NEW: Road to Freedom Sweepstakes! The open roads are calling YOU! And, if you’re the grand prize winner in the Summit Sweepstakes Road to Freedom, you could be traveling those roads on a 2016 Harley-Davidson® Road King® motorcycle! The Summit Sweepstakes starts on May 1st for licensed plumbers. Every time you purchase a Summit product from your dealer between May 1 through September 30, you’re entered for a chance to win. 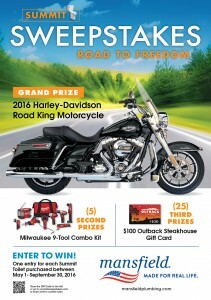 Maybe you’ll drive home the Road King motorcycle … or maybe you’ll win one of five second place prizes of a Milwaukee® 9-Tool Combo Kit or one of 25 prizes of $100 Outback Steakhouse® gift cards! The more high-performance Summit toilets you purchase, the more chances you have to win. Contact your Mansfield dealer right now to get started. Then burn up the roads getting your toilets purchased and installed during the sweepstakes for your chance to win!